susceptible is the sensor to magnetic interference of some outside source that may contact the sensor from other angles? Figure 2: The angle between the AMR Bridge current and the applied magnetization will determine the quality of the sensor output signal. The behavior of anisotropic magnetoresistive sensing devices can vary under certain conditions. Most critically, the magnetoresistive effect can be extremely angular dependent. The angle between the AMR Bridge current and the applied magnetization on the device determines how much the resistance will change. This is depicted in Figure 2, while Figure 3 shows a demonstration of how the output can change as the angle changes. Figure 3: The change in resistance of the AMR Bridge shown as a function of the angle between magnetizing current and the magnetization. 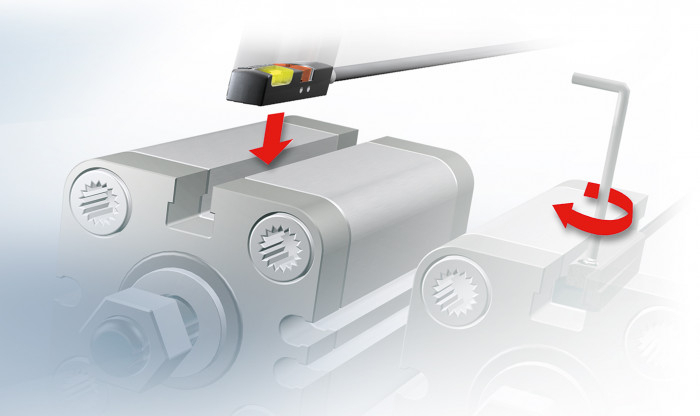 When used in a standard application with only the sensor face looking at the magnet, this is not an issue as the AMR device is angled to allow for ideal operating conditions. But in the event that the device senses a magnetic field from someplace other than directly in front of it, double switching conditions and generally unpredictable behaviors can be seen. At this point, the question becomes “how can we minimize the risk of the sensor’s susceptibility to unintended magnetic fields?” The answer to this comes in the directional sensitivity of the AMR Bridge. AMR devices can be either unidirectional, bidirectional, or omnidirectional. The unidirectional sensor is designed to only be activated by one of the poles, and the output turns off when the sensor is removed. Bidirectional sensors are activated by a pole like the unidirectional is, however the output must be turned off by using the opposing magnetic pole. Lastly, the omnidirectional sensor is capable of being activated by either pole and turns off when the magnet is removed from the sensing zone. Since the omnidirectional device is designed to be able to detect a magnetic field coming from multiple poles and directions, it has a much more consistent response when in an application that could be prone to encountering a magnetic field that isn’t directly in front of the sensing face. There are a handful of factors that determine directional sensitivity of an AMR chip; however, the largest comes from the handling of the resistance bridge offset. 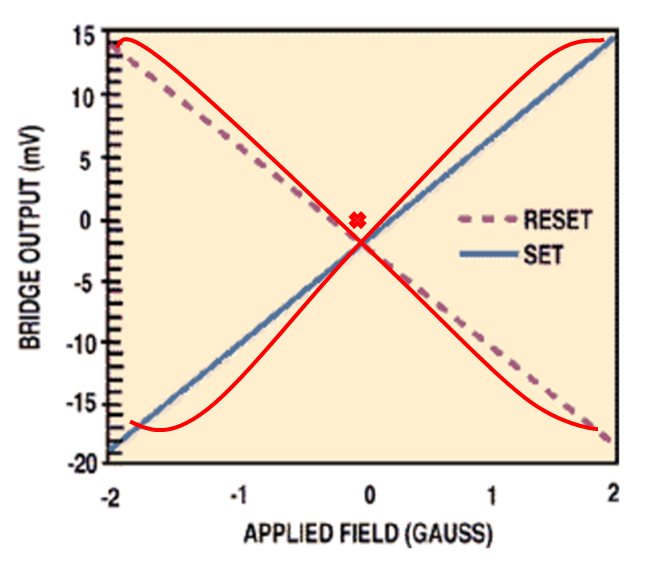 The offset is simply the voltage difference when no magnetic field is present. This is a problem that arises due to the transfer characteristics (Figure 4) of the AMR sensor and is a common property on the datasheet of an AMR chip. This offset is usually handled within the AMR IC, which means that the directional sensitivity is pre-determined when you buy the chip. However, there are some AMR manufacturers that produce “adjustable offset” devices, that allow the user to determine the directional behavior. While unidirectional and bidirectional devices have their place in certain applications, it remains clear that an omnidirectional sensor can have the most angular versatility, which is critical when there’s a possibility of magnetic fields surrounding the device. 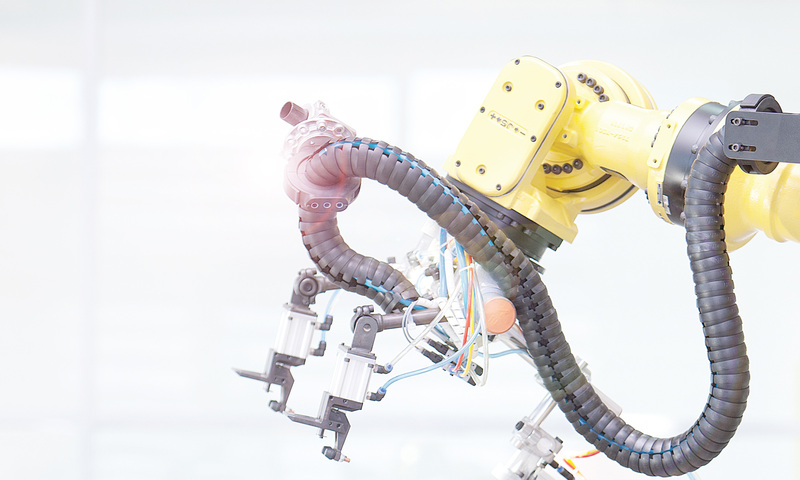 While many anisotropic magnetoresistive sensors do have built in stray field concentration, it is still a good idea to evaluate the needs for your application and make an informed decision in regards to directional sensitivity. For more information visit www.balluff.us.